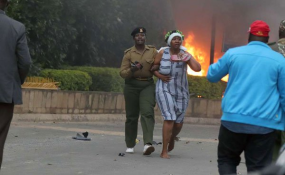 Police rescue people from the Dusit hotel complex on January 15, 2019 following an attack by suspected terrorists. When evil deeds like terror strike fear in the hearts of many, there always emerge individuals who, through their acts of selflessness, restore people's faith in humanity. Security consultant Inayat Kassam for the second time in five years, rushed to the scene of a terror attack and joined the authorities in eliminating hostile attackers and rescuing hundreds of people -- most of them perfect strangers. On September 21, 2013, after four masked gunmen attacked the Westgate shopping mall and killed at least 67 people, he was among the first responders. And, after the 20-hour operation at 14 Riverside Drive, Mr Kassam retreated to take a break away from the public limelight. "He will not be available for the next couple of days for obvious reasons but when we get more information we will get back to you," a lady who answered his phone told Nation. Mr Kassam joined the multi-agency team led by General Service Unit commandant Douglas Kirocho Kanja that rescued at least 700 people from the Riverside complex. The civilian appeared in several photos taken at the scene, evacuating tens of people that were trapped in the complex. Kenyans across the country have been paying glowing tribute to Mr Kassam, calling him a hero for his selfless sacrifice to rescue victims trapped in the office complex. But he was not the only superhero on the day. An unidentified woman took time off her personal schedule to provide free food to security personnel and survivors. Not even the heavy gunfire, occasional blasts and heart wrenching scene kept the woman from doing what she had set her mind to. Efforts to reach her were made difficult as the media was asked to stay further away to allow security and medical personnel move in and out of 14 Riverside Drive with ease. The woman, in a flowered kaftan with a maroon scarf wrapped around her head, was seen serving breakfast from the back of her white car in a picture that has since gone viral. Another category of heroes who worked overtime was the medical personnel, who acted swiftly under immense pressure.